Sometimes your subconscious practically hits you over the head when you’re trying to understand your dreams. The interpretation is that easy. In the dream, I was sitting around a table with other people present. We were waiting for a meeting to begin. There was no conversation. Nothing out of the ordinary for a regular business meeting was going on. It was just reflective of the fact that later the next day, I had a meeting to go to. That’s it. I don’t think you could call it a precognitive dream. The meeting was guaranteed to happen. A while back I had another dream with similar content. An advisor was giving a class. 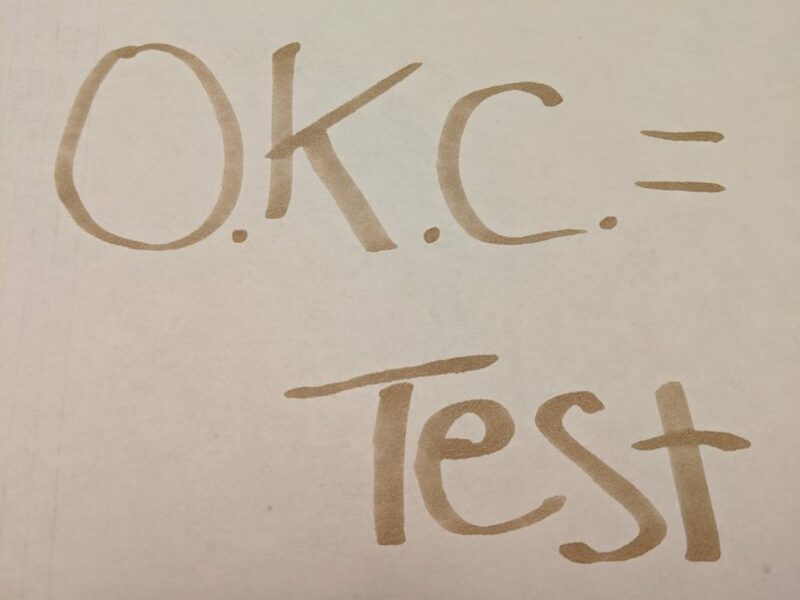 The “class” had a simple message: “OKC = test.” The dry erase board had that equation. He held up a card with those words on it. The speech he gave belabored this point. “Oklahoma City is going to be a test. That’s what it is, a test. Understand? It’s a test of you, for you,” the advisor said. Everything he said belabored that point. I sat there, listening to him aptly as he emphasized his point. I was going to Oklahoma City to interview for a desirable job later that week. There is no big mystery that job interviews are a test of sorts. That was another easy-to-interpret dream. Look I get it. That meeting in Oklahoma City was going to have a major impact on my life either one way or another. My subconscious wasn’t providing me with any spectacular insight. If that was the only kind of insight I ever got from dream journaling, why should I even bother? Who wants to sit around in a meeting in their dreams and then do the same thing in real life? Who wants to listen as an imaginary someone belabors a point over and over again? Who really wants to remember dreaming about being in a meeting or a dream character belaboring a point? Other people have dreams where they’re going on a walk around their neighborhood or washing a pan. My wife recounted a dream where she cleaned our whole kitchen. When she woke up, she was disappointed to find out the work hadn’t been done. These kinds of dreams are boring to recount, boring to admit to, absolutely mundane dreams. When you have them, you can wonder why am I bothering to do this. I must be a boring person in order to have such a dull dream. No, don’t say or think that. Don’t make this about yourself or your worth. These kinds of dreams are important too in their own way. What Do Boring Dreams Mean? They’re kind of a placeholder. They can tell you where you are in your life. They’re telling you what’s important, what you’re looking forward to. They’re important in conjunction with everything that’s going on in your life at the time you have them. To analyze and understand, use the same process goes for any dream. Maybe the dream means more than it seems on the surface. Use the Dream Recovery System to probe for details. There can be important details in these dreams. For example, “OKC = test” appeared in several different ways in the dream I had that belabored the point. Don’t feel bad for having these dreams. In a way, it’s reflective of the fact that you’re waiting for something to happen in your life. You’re in an in-between time. It is what it is, nothing more, nothing less. Remember you don’t need to discuss these dreams with anyone unless it’s to talk about how you’re looking forward to one thing or another. Eventually, something will happen in your life and that will give your subconscious better and more interesting material to work with.